Mamma has been unwell for the past week so the family have been taking turns helping out. My daughter stayed over during the week and weeded several garden beds; my sister did lots of shopping and made a big pot of vegetable soup. This weekend is my turn. I am staying over and have been cooking most of today. This morning I made a batch of biscotti for mamma. Whilst I was dusting them with icing sugar, she told me a story about the retro green 99% pure aluminium “Propert multi-sift” I was using. 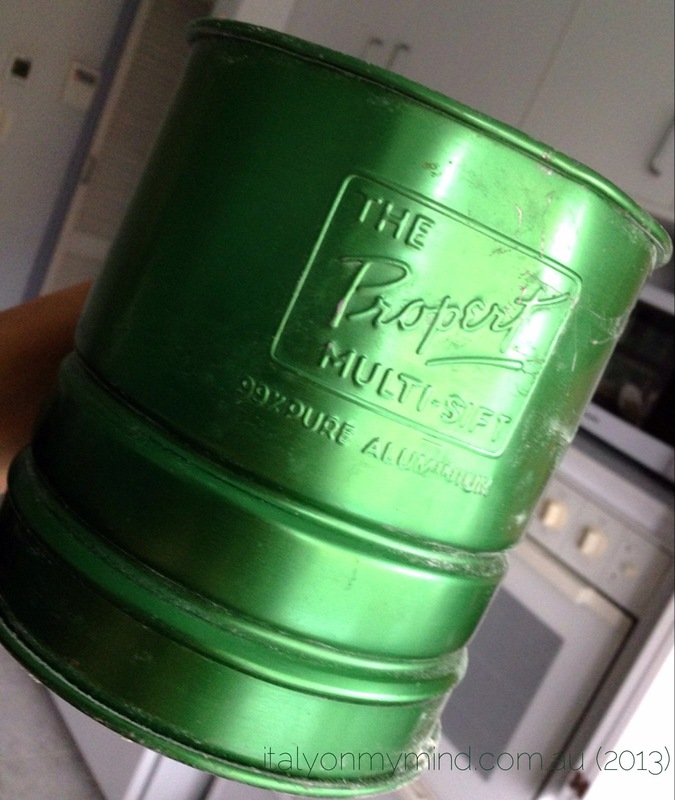 Mamma has had this green sifter since the early 1950s. She told me that she was with santola Maria when she bought it. I always called her santola even though was my sister’s godmother. Her husband affectionately called her “cicca” – meaning cigarette stub – she and her husband were mad smokers (it was the 1950s after all…). Santola, my uncle Fide, my father and my mother all worked at the Holeproof factory (which they pronounced oleh-pruf) in Deepdene. 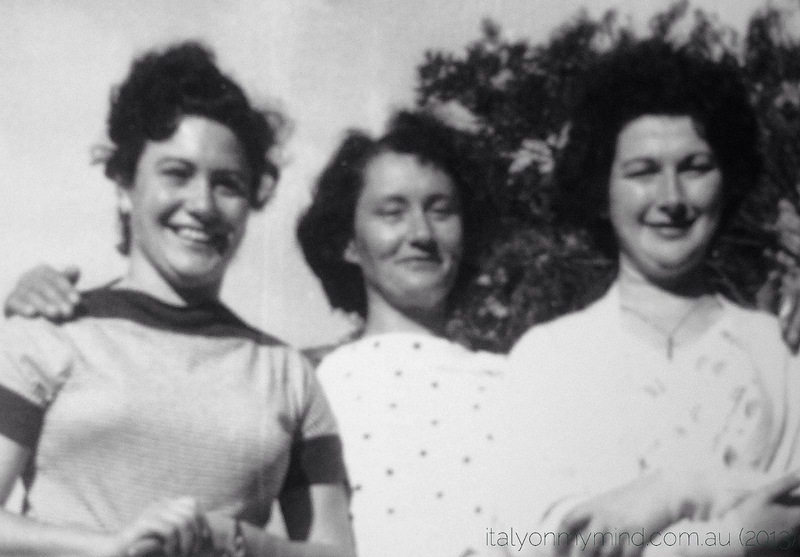 Santola Maria is in the centre of the photo below, my mother is on the right and my aunt Dina on the left. One hot day, having finished an afternoon shift at Holeproof, mamma and santola stopped at the Palace Hotel, near Camberwell railway station for a thirst-quenching beer. Newly refreshed, they made their way down Burke Road, stopping in a homeware shop, at Camberwell Junction. There was a demonstration of the new Propert multi-sift in the shop at the time, a nifty device with a spring that operates by clutching the handle and sifts flour and icing sugar beautifully. Mamma was impressed with how it worked so she bought one. Needless to say, my father was not impressed when mamma arrived home with her purchase as he thought she had wasted money on an unnecessary and fancy gadget. “Ma perche’ ti ga spreca’ tutti quei soldi!” (why did waste all that money) he yelled. I think the fact that the green “multi-sift” is still being used 60 years later has proven him wrong. It has been amazing value for money. It still works perfectly, even though it travelled to Italy in early 1971 and back to Australia in late 1972 when we migrated back here. And it is still going strong in 2013. 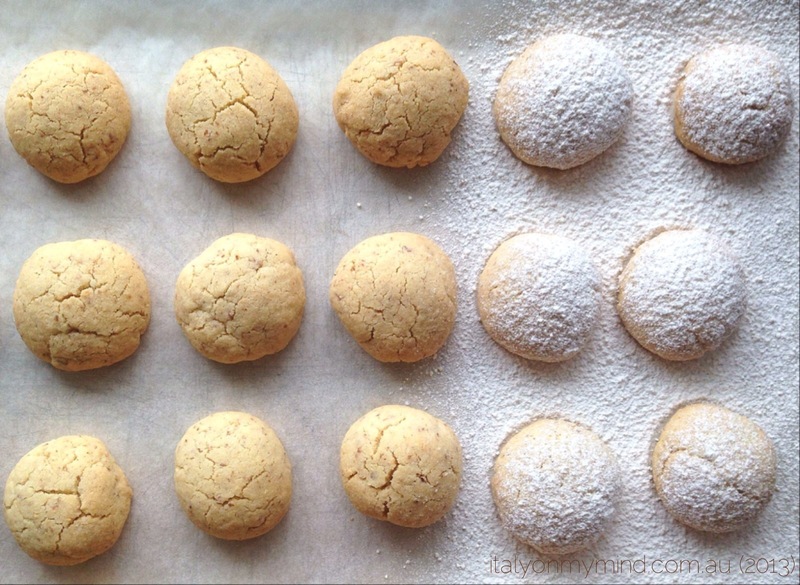 Today I made a variation of kipfel, using ground almonds, but I made them round rather than crescent shaped. Mamma has been making them like this for the past few months as they are easier to make and less prone to breaking in half. 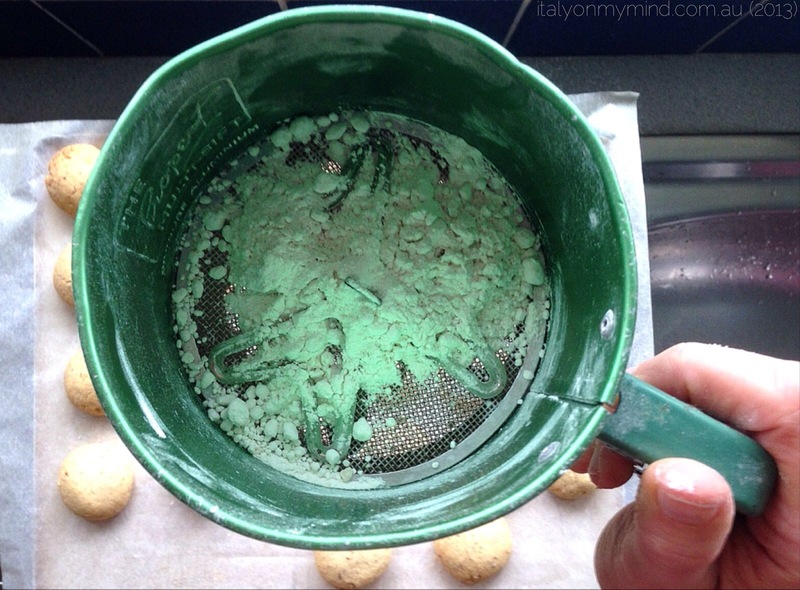 She dusts them with icing sugar using her well-travelled retro green multi sift. The biscotti are delicious and mamma always has some in the cupboard for when visitors drop in. Hopefully she will feel better and be able to share them over a coffee with family and friends soon. Preheat oven to 180 degrees. Mix all the ingredients with your fingers in a large bowl until the mixture is homogenous. 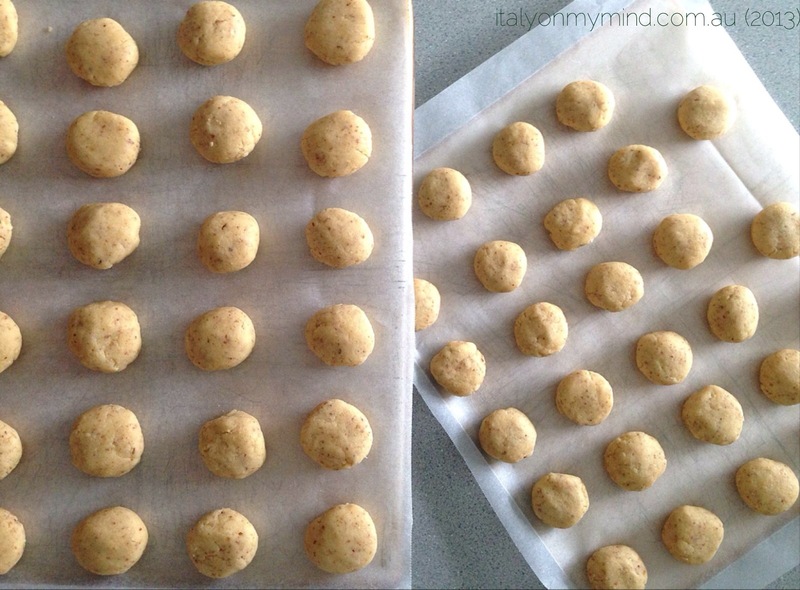 Form into small balls (I made about 50 of them on two trays). Place on oven trays lined with baking paper and bake for 20 minutes. 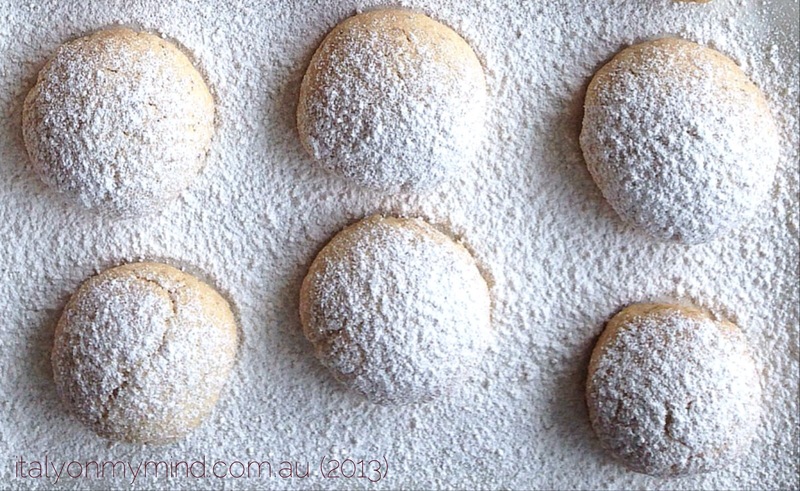 Allow to cool slightly on a wire rack and dust with icing sugar whilst still warm. They will keep in an airtight container for a few weeks. The green color really accentuates the retro factor – love it! :). The cookies look great. I enjoy reading your stories of how this have come about and how everything is tied to your family….it brings back many wonderful memories of my own that are tucked away in my mind! These biscuits are a favourite of mine too….can’t stop at one unfortunately!!! Oh my! What a terrific site you have! I am so pleased to have found you. I just saw a comment you left at Silvia’s Cucina, so I hopped on over, and I will be back. Complimenti! Gotta look after our mothers Paola. Mine had a stroke in late March and is slowly recovering, but as an only child (and sole carer) I’ve been in charge of the menus. She still likes to eat well! Gorgeous blog. As a Northern Italian I love reading your blog. I too have a Santola and call my sister’s one Santola too. And reading the word ‘Cicca’ made me laugh out loud. Grazie Nadia, I love meeting other compatrioti on my blog, particular one who understand that you can have many “santole”! 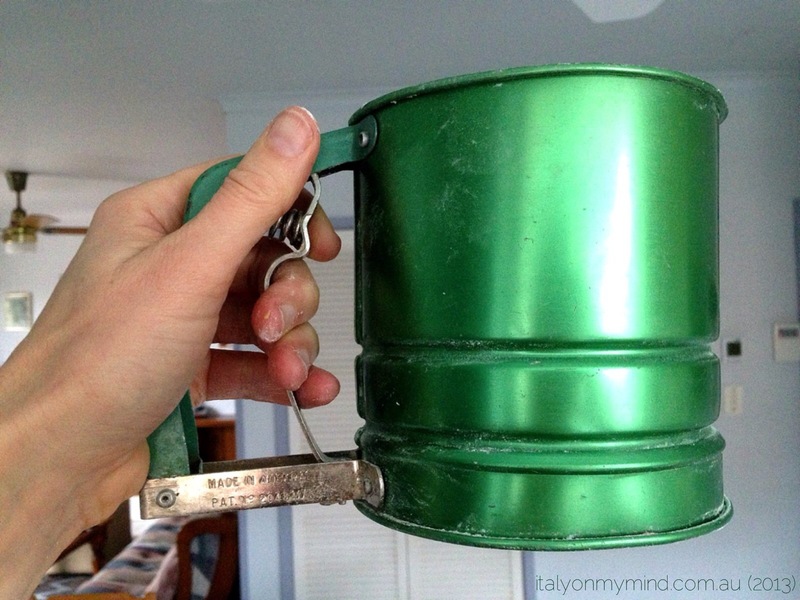 a lovely post Paola , I love the green colour of the sifter and wishing good health to your lovely mother soon .